Have you ever wanted to reconnect with your childlike spirit and live with peace, joy, gratitude, happiness, and an expanded presence of love in your life? 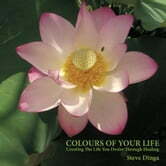 By healing past disappointments and traumatic experiences, Colours of Your Life provides a framework to aid the process of forgiving yourself and others and opening your heart to the possibility of living life to the fullest. For those who are in recovery, Colours of Your Life presents a foundation to continue the work of twelve-step programs. For those seeking a deeper sense of peace and fulfillment, it serves as a holistic approach to wellness. And to those who have been on a healing path, it anchors your spiritual awakening by providing a daily, ongoing discipline to follow. Wherever you are on your spiritual journey, you can return to a place of peace and love, a place you have only left in your thoughts, not in reality. You can experience a deeper sense of love in the present moment, aware of your authentic self, free to create the colours of your life. For the bee a flower is the fountain of life, and to the flower a bee is a messenger of love, and to both the bee and the flower, the giving and receiving of pleasure is a need and an ecstasy.